1. Crumble 75g (3oz) light digestive biscuits into a bowl, not too fine. Divide the crumbs between 6 wine glasses or small tumblers. 2. Place 200g (7oz) Carnation Condensed Milk Light (half a can) into a bowl and add the zest and juice of 1 lemon and 1tsp vanilla extract (optional). Stir together until the mixture has thickened. 3. Whisk 150g (5 ?oz) extra light cream cheese and 150g tub 0%fat Greek yogurt in a small bowl until smooth then fold into the thickened condensed milk, don’t over beat. Spoon the creamy mixture over the biscuits. Chill for at least 30 minutes to 1 hour. 4. 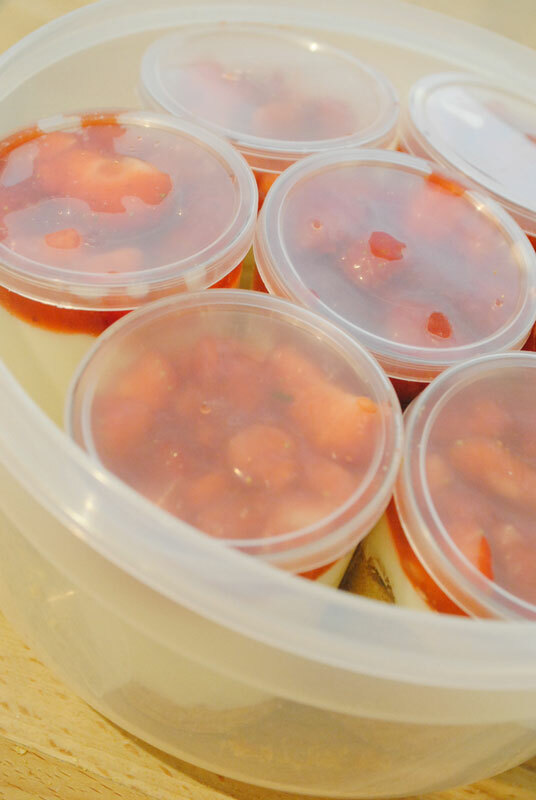 Chop 250g (9oz) fresh strawberries, mix with 3tbsp strawberry jam and top the cheesecakes with the fruit to serve. Using the juice of one lemon with half a can of condensed milk in this recipe acts as a setting agent, thickening into a deliciously easy cheesecake topping without gelatine.